The newer partner of Gate is Harbledown services. 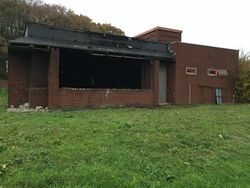 The former diner, bare and burned out. Despite being close to the previous service area, this is in an entirely different district. The land to the north of the A2 was divided into small sections, one of which was purchased by a garage in the late 1960s. Despite it being set back from the road, subsequent expansion has brought it very close to the upgraded road. In 1984 a Little Chef was built here. It closed in 2005 and became Mickey's Diner followed by Fab's Diner, which itself closed. In 2006 there were plans to demolish the building and replace it with a large, two-storey motel. The petrol station was developed from the original old garages of the 60s in the 1980s into a Texaco site with a Star Market shop and a classic forecourt layout. 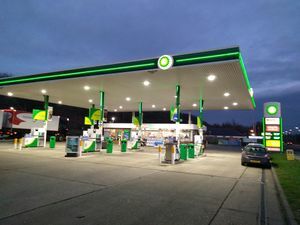 The petrol station was then re-branded to BP in 2016 and the shop re-fitted to become a Spar; the following year the pumps were refurbished to dispense all four fuel grades - there's an autogas pump present as well. The motel, positioned next to the road, is accessed from a deceptively stylish driveway at the back.